Image 18.8 x 29.1 cm. Folio 21.4 x 31.6 cm. Then Surpanakha came to her brother Khara and informed him that the demons who had been sent to help her had been slain by them [Rama and Lakshmana]. On hearing this Ravana became very angry and ordered his capable ministers to prepare the army including horse chariots for war. The current page depicts a scene from the Book of the Forest, the Aranyakanda. According to the story Rama, Sita and Laksmana had been living peacefully in the forest for more than twelve years when they were accosted by the female demon Surpanakha, who demands sexual favours from both Rama and Laksmana. Both inevitably turn down her advances, but it is not until she attacks Sita that the enraged Laksmana punishes Surpanakha by cutting off her nose and ears. She rushes away to appeal to her brother Khara for vengeance. Khara sends some members of his army to kill the heroes, but Rama easily destroys the fourteen demons first sent to kill them. In the current image we see Surphanaka returning to Khara to inform him about the further insult caused. Later Rama confronts a demon army several thousand strong, and still remains victorious, so finally Khara himself is forced to the battlefield. The painting is from a group of pages from the Shangri series completed with this characteristic pale yellow ground, and a long inscription in the upper border. The current work is a particularly fine example from this group, and includes several striking elements. Of particular note is the remarkably fine treatment of Surphanaka's wild flaming hair suggesting the hand of a master artist. For discussion as to the disputed origin of the series, see Archer, pp. 325-29, and Britschgi and Fischer, pp. 12-14. Archer's associates his style IV, with the Books of the Forest, (see Archer Kulu, 5i-iii), and he sees a perceptible influence from Bilaspur in the works completed in this style. 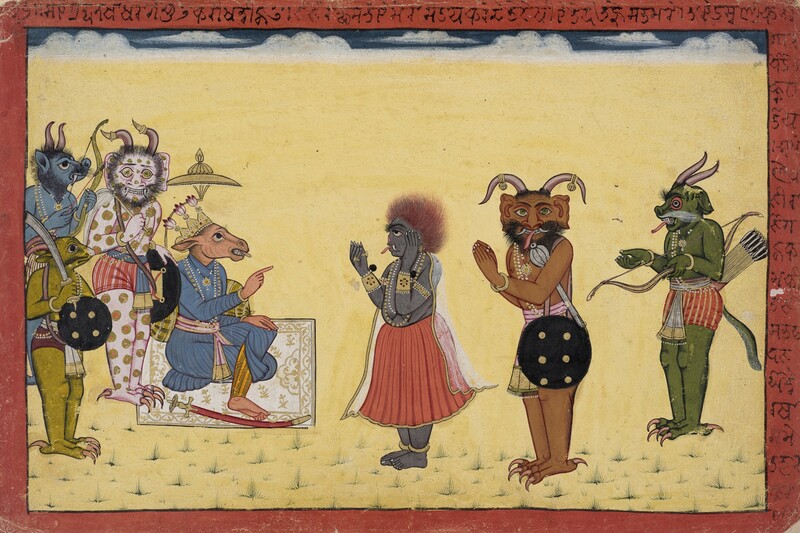 More recently Bagri has suggested that all of the folios from Book III were painted by the same hand, stating that the artist 'closely adheres to the textual source and is perhaps the most consistent and accomplished painter in the Shangri Ramayaṇa series… no other artist can match the range of expression found in his work.' (A. Bagri, The Illustrations of the Shangri Ramayana, Early Court Paintings in the Punjab Hills, Oxford University Thesis, 2010.) Although it is hard to be certain if the artist painted all of the pages in the Book of the Forest there is certainly a consistency of style that is unmatched in any of the other books. This suggests that, at the very least, a master painter from within the atelier oversaw the production of this book from beginning to end, and the genius of his overarching vision is particularly apparent in the current work.